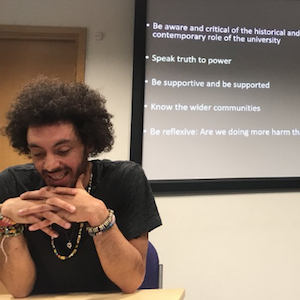 Remi Joseph-Salisbury is a presidential fellow in the University of Manchester’s Centre on Dynamics of Ethnicity, a trustee and organiser with the Racial Justice Network, and a steering member of the Northern Police Monitoring Project. He is the author of Black Mixed-Race Men (Emerald Publishing, 2018) and co-editor of the forthcoming collection The Fire Now: Anti-Racist Scholarship in Times of Explicit Racial Violence (Zed Book, 2018). He is also the ‘Race and Resistance’ columnist for Red Pepper Magazine.